Dr. Julie Buzby, DVM, a member of Grey Muzzle's Advisory Board, is a practicing integrative veterinarian who seeks to blend the best of Western medicine, alternative therapies, and creative tools for maximum wellness in her patients. This guest article, written by Joy Schneider, was originally featured on: https://www.toegrips.com and is reprinted with her permission. 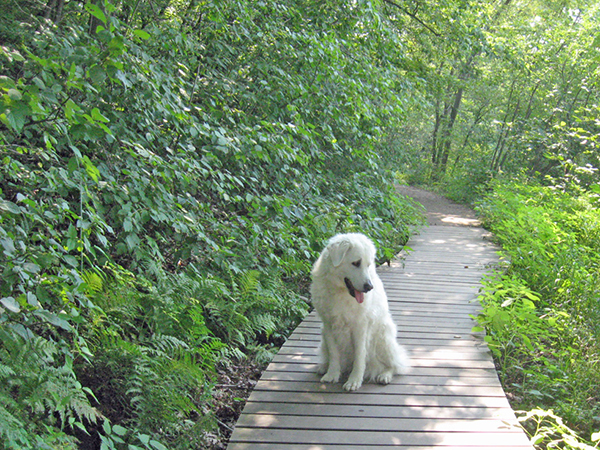 I know firsthand having a thirteen year old Kuvasz, keeping her mind fit is so important to her overall quality of life. Just as with many aging humans, senior dogs often develop dementia. There is no cure, but there are some things pet parents can do to slow the process. At Katie’s age, it is normal to see some signs of her mind becoming forgetful, but I believe her healthy lifestyle has helped keep her mind pretty sharp. 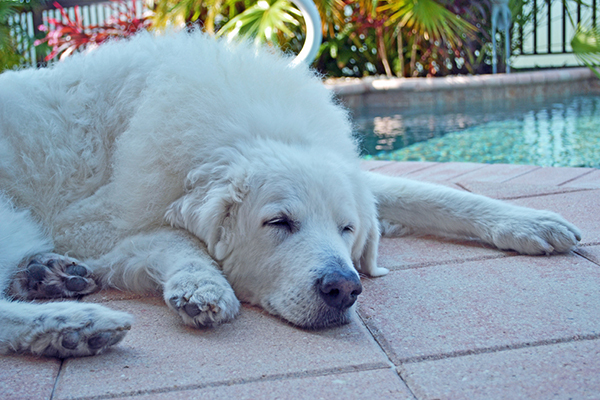 What are some things any pet parent can do to help keep their aging dog’s mind fit? 1. 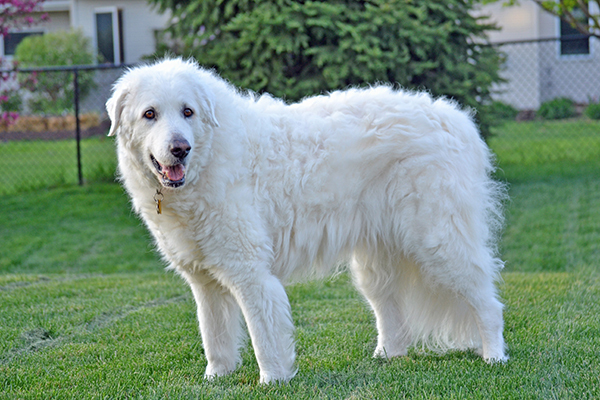 Make sure your senior dog gets a veterinary exam twice a year, or every three months if you can swing it. Your veterinarian may detect things that you cannot see, increasing the likelihood of being able to treat them and/or slow their progression. 2. Feed your senior dog a healthy diet. As a dog ages, dietary needs change. There are so many food choices on the market, and even some that claim to help keep a dog’s mind working well! Studies have shown If you are unsure what your dog should be eating, consult with your veterinarian. Get out and exercise with your dog! 3. Get out and exercise with your dog. Turn your dog into your fitness buddy! Just because a dog is a senior dog doesn’t mean they don’t need to exercise. Rather than walking for an hour or more, maybe take a couple shorter walks, or take a longer walk, but at a slower pace. Katie has enjoyed walking her entire life. She no longer can go on really long, fast walks, but she really enjoys getting out and going around the block or taking a slow forty minute walk around our neighborhood. Walking keeps a dog’s muscles in shape, gets the heart beating, and supplies the brain with more oxygen. A note from Dr. Buzby: I’m not one to readily recommend prescription diets for my patients, but I’ve heard numerous reports from colleagues who recommend veterinary prescription “brain health” diets (rich in antioxidants and essential fatty acids). They report dramatic improvement in the cognitive function of many of their patients in as little as 2-4 weeks. In addition to a special diet, there is a laundry list of supplements which may improve cognitive function in dogs, including melatonin, S-adenosylmethionine (SAMe), curcumin, and antioxidants. Talk to your veterinarian about diet and supplement recommendations for your dog. 4. Keep your dog’s mind engaged by experiencing new places. One thing I have done with all my dogs is to take them to as many places as I can. Dogs love to discover new places, with new smells, new sounds, and new things to see. If your dog is up to it, travel. Katie has been to eleven states, my other two dogs, eighteen. Taking a road trip with your dog is such a wonderful experience for both of you. There is a lot of bonding time, and you both get to explore new places and create new memories together. These days more and more hotels and other types of lodging are dog friendly, making traveling with your best friend easier than ever. If you aren’t up for a road trip, take your dog to a fun new place in your area for a nice walk. Katie really loves it when I take her to a different place for a walk. I can tell by the spring in her step how happy she is. 5. If your dog is able to still do tricks, teach her some new ones. Sadly, with Katie’s arthritis, she has a lot of trouble just sitting or lying down, but for dogs who are still fairly active, teach them new tricks. Katie has lost most of her hearing, which means she has been learning to focus completely on my hand signals. I teach all my dogs commands as puppies both with voice and hand signals, but Katie is totally dependent on the hand signals these days. Learning is an excellent way to keep the mind working, and dogs of any age love to learn. Katie loves her busy ball! 6. 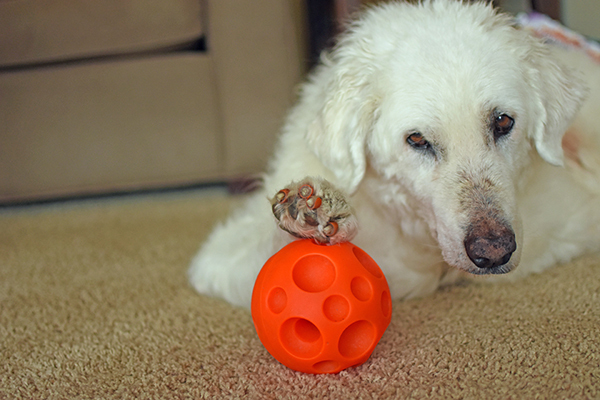 Whether your dog is able to be active or not, puzzle toys or interactive feeders are a great choice. Every dog needs to eat, so why not let them use their mind at mealtime? Katie has her treat ball which I got for her when she was a puppy. She has always loved it, and still does. Sometimes when I’m gone with my other two dogs, I will put some of Katie’s meal in her treat ball so she has something to do while the rest of us are out. I think it brings some of the puppy out of her when she plays with it. She has a special bond with that old ball! A note from Dr. Buzby: A 2007 study on cognitive dysfunction in older dogs concluded that an antioxidant-rich diet PLUS mental stimulation through play and other exercise yielded significant improvements in brain health. 7. Does your dog have friends? My Katie has always loved other dogs. These days she still enjoys visiting the various dogs she knows around the neighborhood. She also enjoys spending time with my other two dogs, especially Emma who has been with her for the past nine years. I think it is comforting to her to hang out with other dogs. I do have to be careful as she gets frustrated when she can’t keep up with really young dogs, and she seems to get a bit fearful, but in general, she loves to visit, say woof, sniff a bit, and move on. Just because a dog is older, can’t walk or run as they did when they were young doesn’t mean they should stay in the house and do nothing. Get your senior dog moving. Help them to keep experiencing life. It will keep the aging dog’s mind fit, and you will feel good about helping your dog feel good. 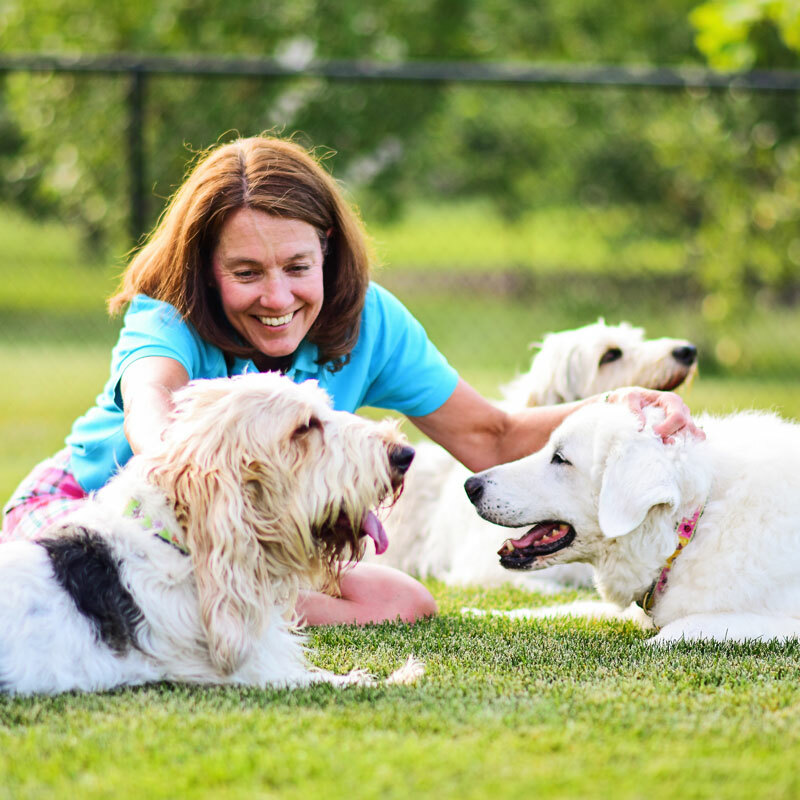 Joy Schneider is a pet parent to 13 year old Katie the Kuvasz, 9 and 2 year old GBGV’s, Emma and Bailie, and 2 rescue cats, Bert and Sophie. She is passionate about health and fitness for her pets as well as herself. Her hobbies include photography, writing, running, as well as nose work and tracking with her GBGV’s. Joy has traveled the world, lived abroad for eleven years, and is now living in Minnesota. She is the human behind the humorous and informative blog MyGBGVLife.com which is written from the viewpoint of Emma the GBGV. 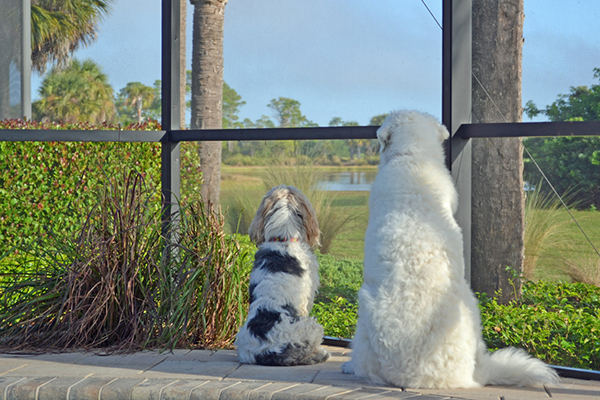 You can find more articles by Dr. Julie Buzby on her new blog, The Buzby Bark. The information presented by The Grey Muzzle Organization is for informational purposes only. Readers are urged to consult with a licensed veterinarian for issues relating to their own pet's health or well-being or prior to implementing any treatment. The Grey Muzzle Organization improves the lives of at-risk senior dogs by providing funding and resources to animal shelters, rescue organizations, sanctuaries, and other nonprofit groups nationwide.